Where in Britain is the most impressive collection of Saxon carvings to be found? London? No. Winchester? No. A grand English cathedral perhaps? No. In fact, they are tucked away in Leicestershire, inside a small village church perched high up on a hill. They are, without a doubt, the crème-de-la-crème of known stone work from the eighth and 10th centuries, when the Midland counties formed the heart of Mercia, a kingdom that had a reckoning throughout Europe. The church of St Mary and St Hardulph, in Breedon on the Hill, stands on the top of a partially quarried hill, a spectacular sentry standing guard on the county border with Derbyshire. Perhaps, from the outside, the church isn't anything remarkable; a traditional Norman design – but inside are carvings that will take your breath away. They are believed to have been removed from the dilapidated and now long-since vanished Anglo-Saxon church and incorporated into a new complex of religious buildings in the 13 century. The church today is essentially the eastern end of this extensive group of buildings, and its value to our history and understanding of Anglo-Saxon Britain is priceless. The carvings fall into four groups. The first two would have had a length of 63ft and originally would have run in parallel bands around both the inside and outside of the main Saxon church. These were subsequently built into scattered lengths around the interior of the new church. The first band has a width of seven-inches and shows continuous interlacing vine scroll patterns. The second is larger with a width of nine inches and a much more complex design of geometrical patterns. Various images are carved within the patterns, including ornate animals such as birds and hares, strange beasts and human figures, such as mounted huntsmen with spears. The character of these carvings has been compared to the type of decoration found in north-west France, and are thought to have been sculpted by Frankish stone workers, who travelled to Breedon on the Hill from the continent. 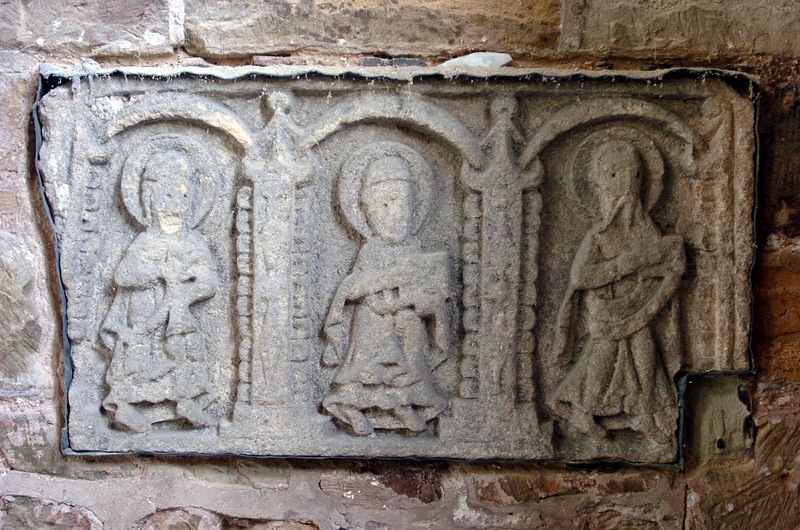 The third group of carvings are a series of figure panels set in arches comprising mostly of saints, an early depiction of the Virgin Mary and the unique and fantastically-preserved Breedon Angel. The final group is a small collection of free-standing decorated cross fragments from the Viking age of Anglo-Saxon Britain. 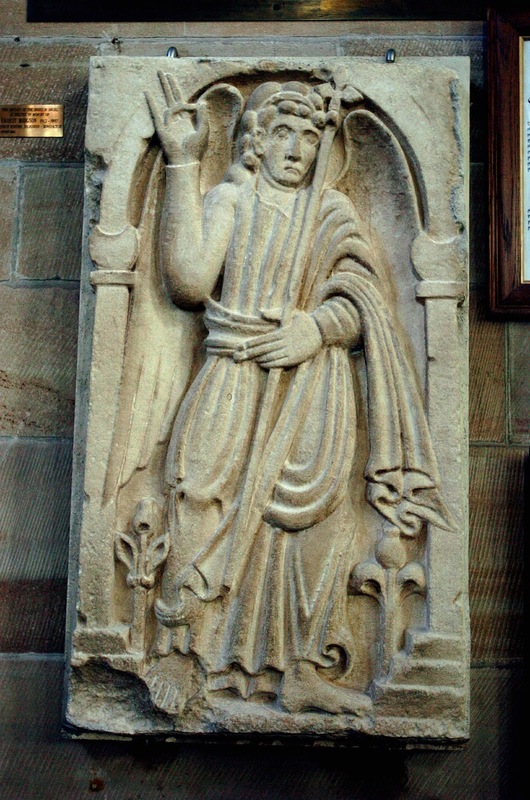 Set in the bell-ringing chamber of the church tower is perhaps the most famous piece of Breedon sculpture, this is thought to be a depiction of the Angel Gabriel. 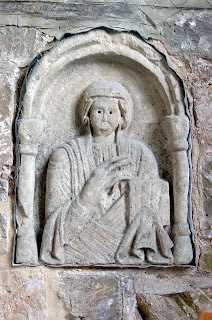 Repositioned between two late 12th century Norman windows is the Breedon Angel, one of the finest surviving examples of Saxon figure sculpture and perhaps the earliest known carved angel in Britain. The figure is set within an arched opening with crescent-like capitals supported on pillars resting on a stepped base. In one hand is held a cross-headed staff while the other is raised to give the Byzantine-style blessing. The body is covered in robes and the angel’s wings are clearly seen draping down his back. 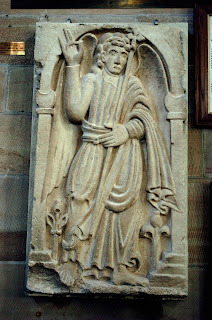 As the sculpture is not accessible to the general public, a moulding of the frieze has been made and is on display in the south aisle of the church. At the west end of the north aisle are sections of free-standing crosses, which would have originally stood outside the Saxon church. The tallest was re-used as a staircase step in the building of the new church, before being rescued in restoration a few years ago. It has an interlace vine scroll design. The other cross fragments are far more interesting. Three show various dragon-like beasts, so beloved in Saxon and Danish art. One dances on four three-toed feet with a body decorated with crescent moons. Although its head is missing, the tongue is seen wrapping around the beast’s neck. The next also has a large tongue but has a coiled snake-like tail and no hind legs, looking more like a sea serpent. Such creatures were common in early pagan-Christian myths of the Merovingian dynasty of Frankish kings, as the first Merovingian king – Merovich – has the myth that he was fathered by one. The third beast is too worn to see any real detail. The most interesting and spectacular cross piece, though, depicts the Garden of Eden scene. Adam and Eve are seen picking forbidden fruit from the Tree of Knowledge as the evil serpent is wrapped around it. Again, the style of art appears to be Viking in character. 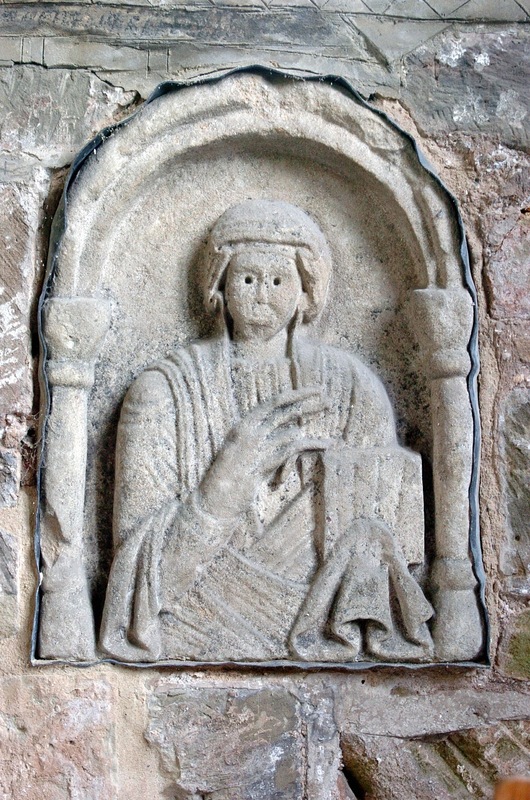 Breedon also has the largest collection of Anglo-Saxon human figure sculptures in Britain. They are set in decorative frames with the largest behind the altar in the south aisle. The figure is holding a book in the left hand, and like the Breedon Angel, giving a Byzantine blessing with the other. This helps to date the sculptures to the eighth to ninth centuries. The figure’s hair is covered, which suggests it is female and scholars have interpreted the woman to be the Virgin Mary of the New Testament. Flanking the central figure are two sets of three saints, with a further two immediately to the right on the south wall. Their haloed heads have the same form and character as the Mary sculpture and are carved carrying books, scrolls and interestingly, one carries what can only be described as a doll. They are believed to be saints but their specific identity is all but unknown. Further along the south wall is a large grey slab of sandstone with the largest animal carving in the collection. A lion-like creature with a staring owl-like face stands out prominently above all the other carvings. It is known as the Anglian Beast, believed to be the work of a local Mercian stone mason. But why would stone workers come from all over Britain and Europe to decorate a Saxon church? What was so special about Breedon? In Anglo-Saxon times, it appears that Breedon was a lot more important than most people know. Since the dawn of civilisation, Breedon has always been a major settlement. A polished stone axe of the new Stone Age or early Bronze Age, some 4,000 years ago, was found in the village showing a truly ancient origin, and we know for a fact that the hill was occupied in the Iron Age. Impressive ditches and rampart banks surrounded the hilltop and vast amounts of pottery shows us that from the first century BC into the Roman age, Breedon was a major, fortified settlement known as a hill fort. When the Romans invaded, the area gradually became depopulated. A Roman villa was erected less than a mile south of the hill, suggesting this became the main populated site in the area in Roman times. It is believed, however, that a Romano-British temple or shrine was erected on top of the hill, as was frequently occurring elsewhere. The ancient British often associated prominent natural features with spiritual and supernatural forces and Breedon certainly fitted the bill. Since the early fourth century, Christianity had become the official religion of the Roman Empire, so the inhabitants of Roman Britain were essentially Christian. As the Roman Empire collapsed and as Germanic people brought their traditional beliefs to Britain, paganism became popular across the country. By the turn of the seventh century, Breedon lay in the land of Tomseti, bordering the kingdom of the Middle Angles to the east. 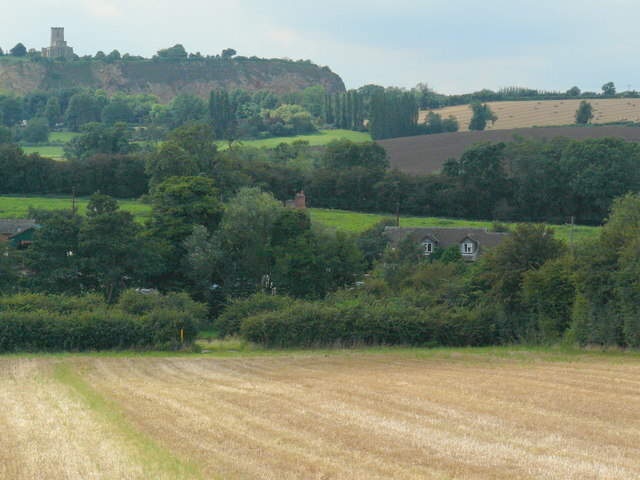 Both soon became part of the kingdom of Mercia with its important southern centre by the River Trent, at Repton, seven miles west of Breedon. Between 626 and 654, King Penda, one of the most powerful warriors of his day, ruled Mercia. He was a staunch follower of the old gods of northern Europe. Evidence for these old beliefs often survive in place and field names. Breedon has Thunderbush Meadow and Thunderbush Flat. Thunder refers to Thunor, or Thor, son of Odin. By this time, Christianity had begun to re-establish itself in Britain. In the kingdom of Northumbria it resurfaced via Ireland and in the south and east it was reintroduced by St Augustine’s Mission from Rome. In 653, Peada, son of Penda, married Elfleda, a daughter of King Owsy of Northumbria, on the understanding that he became a Christian. He obliged and was baptised by Finan, Bishop of Lindisfarne. Peada returned to Mercia with four priests – Cedd, Adda, Betti and Diuma – and after the death of his father in 654, he became the first Christian king of Mercia. On taking control of the Midland lands, he sought to establish Christianity as the state religion. His first act was to build a monastery dedicated to St Peter at Peterborough. Peada only reigned for a year, but his work was continued by his brother Wulfere who succeeded him. In 676, Aethelred, third son of Penda, became king, ruling until 704 when he himself became a monk, dying in 716. Before his death, he dedicated great swathes of land to the monastery of Peterborough, which included the lands of Breedon. These lands were given to a powerful patron called Friduricus, “for the foundation of a monastery to further spread Christianity”. A priest of Peterborough called Hedda was appointed as the first abbot. The monastery of Breedon was established right in the heart of Mercia, inside the defences of the old Iron Age hill fort. The king granted Breedon Monastery much of the surrounding land, and it was to play a highly influential role in over a century of powerful Mercian expansion, making the kingdom the most powerful in the country. By 669, Breedon was in the diocese of Lichfield, which also included Leicester, until it had a more permanent separate Bishopric from 737. 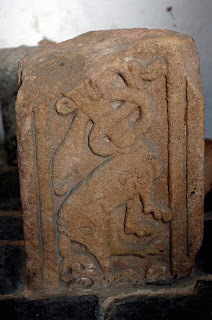 Breedon’s importance is noted in the Anglo-Saxon Chronicle and also by the Venerable Bede who records that in 731 a priest at Breedon called Tatwin was made Archbishop of Canterbury. Many notable people of the day were also buried there such as St Aerdulfus rex, St Cotta, St Fretheric and St Benna. Their lives are unknown to us now but their status as saints probably made Breedon a place of pilgrimage. 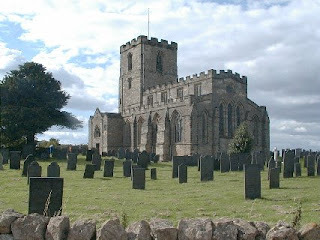 St Aerdulfus rex is a name that suggests a king made saint and could be a variation of St Hardulph – whom the current church at Breedon is named after. St Fretheric may be Friduricus who was granted the lands of Breedon for the construction of the monastery. What Breedon may have looked like in Saxon times needs some imagination compared with what it looks like today. The grand monastery stood high on a hilltop, at this time unaffected by quarrying. It overlooked the surrounding land and could be seen from miles around, in every direction. To make it even more impressive, it was encircled by the renovated Iron Age bulwarks and ditches, topped by a ‘precinct wall’ or timber palisade. Later in the ninth century, Mercian power went into decline with ever increasing raids by the Vikings. In 874, the Danish army, who were still pagan, advanced from the north, setting up a base at Repton before sacking the Midland counties and forming the Five Boroughs. The Bishop of Leicester fled south to Dorchester and Burhed, King of Mercia was expelled. One imagines the monks at Breedon also fled and what they left would have certainly been looted. However, the monastery wasn’t destroyed. The fragments of Viking carved crosses of the late ninth and 10th centuries, after the Danes had become Christian, show that the church, if not the monastery, became active again. It is believed the monastery was revived to all its pomp late in the 10th century as some of the surviving sculptures are thought to have parallels with illustrated work of this period. How well the monastery survived the turbulent century up to the Norman Conquest is unknown, but the old Saxon church building did survive the conquest as William the Conqueror granted it to Robert de Ferrers, first Earl of Derby.